This is a great supper dish. The lamb gives it a lighter, sweeter taste than the more traditional beef. Chillies vary greatly in heat, so do adjust the quantity to suit your taste, but err on the side of caution. You can always add more chilli at the same time as the tomatoes. Set a large pan over a medium-low heat. Add the oil and once hot, mix in the onions, garlic and chilli. Gently fry for about 10 minutes until soft and golden, then mix in the paprika and cumin seeds. Continue to fry for 3 minutes, then stir in the chopped tomatoes, tomato purée, lemon zest and oregano. Bring up to the boil, then stir in the minced lamb. Keep stirring until the lamb has separated and is well-coloured. Drain and rinse the beans, then mix into the lamb with 300ml water. Season to taste and simmer for an hour until thick and tasty. 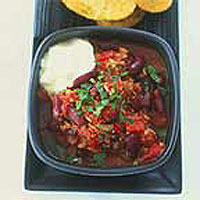 Adjust the seasoning and serve with sour cream, and pitta bread, tortilla wraps or rice. This dish freezes well.